If you love beautiful blue water and the joy and serenity that that comes from a Magazine Caliber Pool and Mother Nature–prepare to be absolutely thrilled. 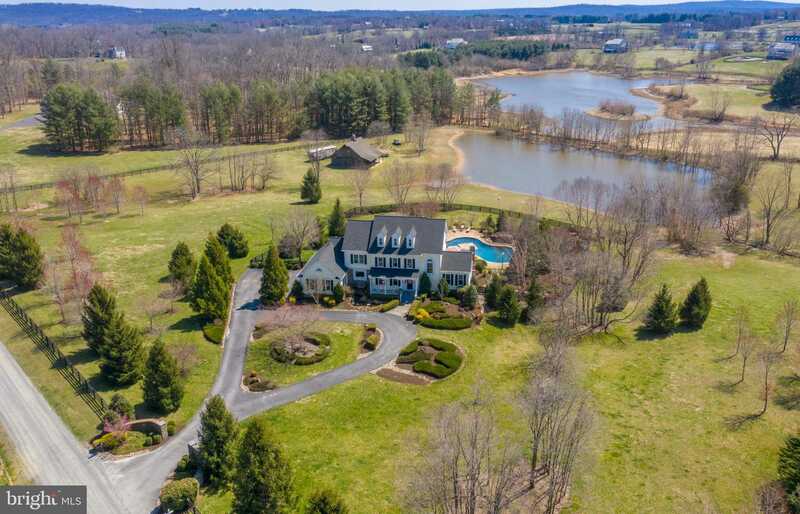 Nestled on a fantastic rolling 10 acres, in the sought-after Large Lot Willowin/Hunting Hills Equestrian Community, this Immaculate & Magical home is a waterfront oasis! From the moment you arrive you will hear soothing water cascading from the stone waterfall coy pond that graciously welcomes you to the front porch. And this is just the beginning. Step inside this Custom home and you will be amazed at the view just off the rear of the home: a Stunning free form 50,000-gallon Heated Salt Water Pool w/ Stone Waterfall is surrounded by expansive hardscape and Mature Professional Landscaping. Just beyond the Mesmerizing Pool, is a rolling lawn that opens to a Lovely Large Stocked Pond- home to Bass and other fish, Canadian Geese, Mallards, Visiting Bald Eagles and Swans. Just beyond is yet another neighboring pond that continues the triple water view into the distance. It is this Amazing and ONE OF A KIND view that you will find as you make your way through this very special home with over 5200 square feet and beautifully appointed on 3 finished levels. On the Main level, recently finished wood floors shine throughout delightful formal and informal rooms accentuated by deluxe moldings and natural light. The two story foyer is dramatic yet welcoming and opens to the elegant open concept dining room. The Chef’s kitchen has and abundance of 42~ cabinets, granite countertops, stainless appliances and a pantry. The spacious eat- in area of the kitchen opens to the magnificent architecturally inspired curved Maintenance Free Trex Deck that spans across the entire rear of the home. The Family Room, with gas fireplace, is just off the kitchen and enjoys spectacular views in all four seasons. Also, on the main level, is the large Sunroom, an ideal spot to read and a screened- in porch tucked quietly away just off the main floor study. A Convenient Mudroom with laundry is just off the 3-car garage. Take the stairs pass the built -in bookcases to the lower level and this is where the real fun begins. The Fantastic walk out lower level shines with Commercial Engineered Wood Floors, full daylight windows and a full-sized bar with Butcher block counters and seating. There is space for your Football parties, playing pool, or just relaxing and a lower Guest Suite that has access to a lower full bath. Just outside the Lower Level is the totally unexpected and awesome OUTDOOR LIVING ROOM with a beautiful stone wood burning Fireplace and HDTV hook up and another bar area overlooking the pool. When you~re not swimming or fishing you can head over to the 36 X 36 Wooden Barn with 200 Amp electrical service and a heated tack room with an immense hayloft. When the day is done and it’s time to unwind- the upper level Master Bedroom and Deluxe Bath is a great place to relax and the views are surreal. Three other sizable bedrooms upstairs enjoy unique views. This home is an exceptional value with some of the most spectacular design in outdoor living you will ever see! In addition to the pool and pond you will find stone walls and walk ways, diverse multi seasonal landscaping with night lighting, gardens and beautiful specimen trees. Just some of the recent home improvements include: roof (2018) Water treatment softener (2017), flooring, exterior paint and windows.(2015). The perimeter of the property is fenced with classic black 4 board and the Willowin Riding/Foot Trails can be accessed from the property. Located just South of the Charming town of Purcellville, you will find a historic Main Street setting w/ restaurants & shops coupled with the modern conveniences. Just 20 minutes away is world Famous Middleburg, home to some of the most famous Equestrians & Horses in the world. Golf & Hiking is 15 minutes away and by car you are only 25 minutes to The Dulles Greenway & 40 mins to Dulles Airport.